Researchers at the UC Santa Cruz Genomics Institute have just made it easier to install a copy of the popular UCSC Genome Browser on a private computer. The browser has always been readily accessible online, providing a variety of tools for studying genome sequences. But some users require a local installation so they can use the UCSC Genome Browser with private or proprietary data. A new product, called the "Genome Browser in a Box," enables individual scientists to install the browser on their own computers in about an hour. Previously, local installation of the browser was a laborious process requiring large amounts of server space. "The new product is a virtual environment that allows the installation of the Genome Browser on a laptop with a minimum of fussing over the setup," said Jim Kent, who developed the UCSC Genome Browser in 2000 after helping assemble the first working draft of the human genome sequence. He is now director of the Genome Browser project at the UC Santa Cruz Genomics Institute. The UCSC Genome Browser is an efficient way to access and visualize publicly available information associated with particular genome sequences. The web-based browser is a portal to a database containing the genomes of about 100 species, including human, mouse, and fruit fly. The site gets about one million hits a day and serves about 150,000 users, mainly scientific researchers in academia and biotech companies looking to interpret results. "It's not Google or Yahoo, but it's a respectable website," Kent said. Researchers use the UCSC Genome Browser to locate functional genes, identify sequences associated with disease, and compare sequences between individuals or species. Local installation enables researchers to study private or proprietary genomic data, such as personal genome sequences. The rapidly falling cost of genome sequencing is fueling the growth of genomics in medical research and diagnostics. This raises a range of privacy and confidentiality issues, however, because a person's genome can reveal health conditions or family connections that could lead to profiling or discrimination. As genome sequencing becomes more widely used as a tool for diagnosis and treatment of diseases, the amount of sensitive genetic information will increase. Keeping that information on local computers behind a firewall maintains its confidentiality. But that also separates the data from large web-based databases like the Genome Browser that provide biological context. Applications like Genome Browser in a Box show that there is at least a theoretical fix to the problem of searching large databases using sensitive data, said Max Haeussler, a postdoctoral researcher at the Genomics Institute and the lead engineer for the project. To develop it, Haeussler's team used virtualization technology similar to the programs that allow one computer to run two different operating systems. In those programs, software called a virtual machine simulates one operating system. In the Genome Browser in a Box, a virtual machine simulates a server loaded with the complete browser. 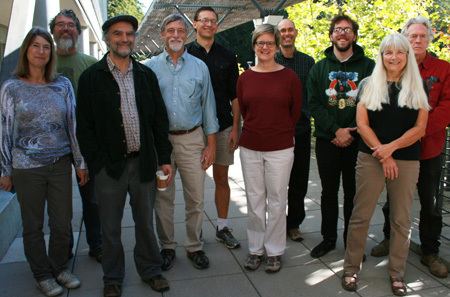 The code for the complete UCSC Genome Browser has been, and remains, open source. That means academic researchers and non-profit users can use that code to recreate the browser on an internal server without paying a licensing fee. Corporate researchers, however, pay a licensing fee to use the browser code. Once obtained, installing the full genome browser requires a week of effort, terabytes of space on a server, and a technologically savvy person to help. With Genome Browser in a Box, the browser developers have greatly simplified that process. The software can run on a laptop, desktop, or server using any operating system. It also has the same look and feel as the web version, Haeussler said. The Genome Browser in a Box is free for academic, educational and nonprofit use, said product manager Ann Zweig. The commercial licensing fee is reduced compared to the fee for the full genome browser. Licenses for the full UCSC Genome Browser or the Genome Browser in a Box can be purchased through a new online store at genome-store.ucsc.edu. The National Human Genome Research Institute provided funding for this project.